Every year, millions of people seek to immigrate to the United States, and with good reason: Opportunities to improve their lives abound here. Immigrants and would-be immigrants want to pursue the American dream. Whether or not they would put it in these terms, they want to be free to think and act on their best judgment; they want to produce wealth and keep and use it as they see fit; they want to make better lives for themselves and their families. In other words, foreigners want to come to America for the same reason the Founding Fathers established this republic: They want lives of liberty and happiness. 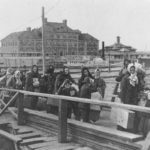 Although some foreigners today are fortunate enough to receive special permission to immigrate to the U.S.—via quotas (as if freedom were good only for a limited number of people) and lotteries (as if Liberty were a scratch-card game)—millions more aspiring immigrants are forbidden entry. Today, productive, life-loving immigrants such as Isaac Asimov, Irving Berlin, Andrew Carnegie, Enrico Fermi, Andrew Grove, Itzhak Perlman, Wolfgang Puck, David Sarnoff, Nikola Tesla, Arturo Toscanini, Eddie Van Halen, and Ayn Rand would likely be turned away from the land of the free. 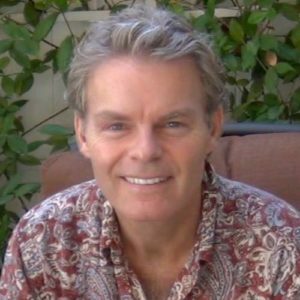 Today, the vast majority of would-be immigrants—including physicists from Israel, software engineers from India, restaurateurs from Mexico, musicians from Canada, architects from Brazil, biochemists from Japan, and countless other perfectly good people—are simply shut out of the melting pot. 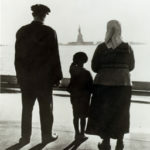 Immigration to the land of liberty is now largely prohibited by American law. This prohibition, however, is un-American and immoral. The basic principle of America—the principle of individual rights—demands a policy of open immigration. Open immigration does not mean that anyone may enter the country at any location or in any manner he chooses; it is not unchecked or unmonitored immigration. Nor does it mean that anyone who immigrates to America should be eligible for U.S. citizenship—the proper requirements of which are a separate matter. 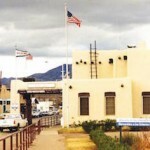 Open immigration means that anyone is free to enter and reside in America—providing that he enters at a designated checkpoint and passes an objective screening process, the purpose of which is to keep out criminals, enemies of America, and people with certain kinds of contagious diseases.2 Such a policy is not only politically right; it is morally right. Because reason is man’s basic means of living—and because reason is a faculty of the individual—a human life, a life proper to man, is a life lived by the judgment of one’s own mind. The basic principle on which America was founded and on which slavery was abolished is an acknowledgment of this fact: Each individual has a moral right to act in accordance with his own judgment, so long as he does not violate the same right of others. This is the meaning of the right to life, liberty, property, and the pursuit of happiness. The right to life is the right to act as one’s life requires—which means, on the judgment of one’s mind. The right to liberty is the right to be free from coercive interference—so that one can act on the judgment of one’s mind. The right to property is the right to keep, use, and dispose of the product of one’s effort—which one does by acting on one’s judgment. And the right to the pursuit of happiness is the right to seek the values of one’s choice—which one does by acting on one’s judgment. Each of these rights—and every other legitimate right—is a species of the right to act on one’s judgment; thus, if we want to protect our rights, we must recognize and reject the one thing that can stop us from acting on our judgment: physical force. If someone puts a gun to your head and commands “Give me your wallet” or “Take off your clothes” or “Don’t criticize the government” or “Don’t cross that border,” you cannot act on your judgment; you cannot keep your wallet or remain clothed or criticize the government or cross the border. The threat of death makes your judgment—your basic means of survival—irrelevant; you now have to act on the gunman’s judgment. Absent such force, you can act as you see fit; you can keep your wallet, remain clothed, criticize the government, cross the border. This fact gives rise to the basic principle of a civilized society: No one—including the government—may initiate the use of physical force against a human being.5 To the extent that this principle is recognized by a society’s citizens and upheld by its government, that society is conducive to human life; to the extent that this principle is rejected or violated by a society, that society is inimical to human life. In a civilized society, whether or not a person is legally free to take a particular action depends on whether he has a right to take the action. If the action will violate the rights of others, then he does not have a right to take it; if the action will not violate the rights of others, then he does have a right to take it. There is no middle ground here: Either a person has a right to take a given action, or he does not. And if he does, he morally must be left free to do so. Suppose, for example, a man in Los Angeles wants to work at a local car wash, and suppose the owner of that car wash wants to hire him. Should the two men be free to do business? Yes. And the reason why they should be free to do business is that each man has a moral right to act on his own judgment, so long as he does not violate the same right of others. In other words, the reason is the principle of individual rights. The right to act on one’s judgment includes the right to contract with others by mutual consent to mutual advantage. No one’s rights are violated by an employer hiring an employee. The employer might fire another employee to make room for the new, more-desirable employee—but (unless doing so breaches a contract) firing an employee does not violate his rights; it does not prevent him from acting on his judgment. The fired employee remains free to improve his skills or lower his rate or seek another job or start his own business. There is no such thing as a right to a job—which is why no one ever has or ever will present the facts that give rise to such a “right.” If a person had a “right” to a job, what would that imply? It would imply that someone must be forced to provide him with a job. A “right” that violates a right is a contradiction in terms. Consider another example. Suppose a man in Virginia wants to move to North Carolina, and suppose a landlord in North Carolina wants to lease the man an apartment. Should the Virginian be free to move? Yes. Should the landlord be free to lease him the apartment? Yes. And why should they be free to take these actions? They should be free to move and to lease because, as human beings, they have the right to act on their own judgment and because neither of these actions violates anyone’s rights. Again, the reason is the principle of individual rights. Now, let us consider some slightly altered examples. Suppose a man in Mexico wants to work at a car wash in LA, and suppose the owner of that car wash wants to hire him. Should these men be free to do business? The question here is not whether it is legal for them to do business, but whether it should be legal. What moral principle governs this situation? The principle of individual rights does. Each individual has the right to act on his own judgment, so long as he does not violate the same right of others. Accordingly, these men should be free to do business. Similarly, suppose a man in India wants to move to North Carolina, and suppose a landlord in North Carolina wants to lease him an apartment. Should the Indian be free to move? Should the landlord be free to lease him an apartment? Again, the governing principle is that of individual rights. We could multiply examples, but the point should be clear: Foreigners have a right to move to America, and Americans have a right to hire, contract, and associate with them by mutual consent. A government that prohibits or limits immigration thereby initiates force against would-be immigrants—and against those Americans who want to associate with them—and thus violates the rights of both parties. The principle of individual rights forbids this prohibition and mandates open immigration. America’s border is not properly a barrier for the purpose of keeping foreigners out; it is properly a boundary designating the area in which the U.S. government must protect rights. Rights-respecting foreigners who want to cross that boundary in order to enjoy the relative freedom and abundant opportunity in America have a moral right to do so. Likewise, American citizens who want to associate with foreigners in rights-respecting ways—whether through friendship, romance, recreation, or commerce—have a moral right to do so. And Americans who do not want to associate with foreigners have a moral right not to associate with them. But no one—including the government—has a moral right to prevent anyone from acting on his judgment. To prohibit a person from immigrating to the U.S. is to violate his right to act on his judgment; it is to retard his ability to live a life proper to man; it is to commit a moral crime. Arguments against open immigration abound, but all of them are invalid. None of them names a principle (i.e., a general truth) by reference to which limiting immigration is a requirement of human life—and each of them calls for actions that violate individual rights. Let us consider several and see, in pattern, how they fail to make their case. No one owns America. American individuals and corporations own specific tracts of land, homes, businesses, automobiles, and the like; and the owners of this property can rightfully prohibit others from entering or using it. But America as such—America the country—is not owned by anyone. There are two kinds of property in America: private property and so-called “public” property. Whereas private property is owned by individuals and corporations, “public” property, which is allegedly “owned by everyone in general,” is actually owned by no one in particular. This is why no one in particular can dictate how it will or will not be used. Consider that if citizen Jones insists on permitting immigrants to enter “his” portion of “public” property, but citizen Smith insists on prohibiting immigrants to enter “his” portion, the conflict cannot be justly resolved. Someone’s “right” to “his” portion of the property “owned by everyone in general” is going to be violated. This and the countless similar conflicts arising from the notion of “public” property point to the invalidity of such property—property which, by its very nature, violates individual rights and generates an endless stream of irresolvable rights disputes. Americans who wish to permit immigrants to visit or use or purchase their private property have a moral right to permit them. And Americans who want to prohibit immigrants from visiting, using, or purchasing their private property have a moral right to prohibit them. But no one has a moral right to stop others from acting on their judgment. So says the basic principle of civilized society—the fundamental principle of America—the principle of individual rights. The “This is our country” argument for prohibiting or limiting immigration to America is invalid and un-American. There are three possible interpretations of this claim: (a) “We have a right to preserve the racial makeup of our culture”; (b) “We have a right to preserve the language of our culture”; and (c) “We have a right to preserve our lifestyle choices.” Let us consider them in that order. If by “We have a right to our culture” opponents of immigration are speaking of a right to preserve the racial makeup of their culture, then what they seek is not to protect American culture but to “achieve” something on the order of Nazi culture. Nothing more need be said about that. As to preserving the use of English in America: In one sense, Americans have both a moral right and a political need to do so; in another sense, however, they have no such right or need. An official national language is necessary for the purpose of clarity and consistency in government documents and legal proceedings. In America, that language obviously should be English, the language on which the country was built. But there is no such thing as a right to force someone to speak English, or to bar him from speaking Spanish or French or any other language. That said, just as American immigrants throughout history have learned to speak English out of practical necessity, so most American immigrants today eventually learn to speak English out of practical necessity: The ability to speak English makes one more competitive in the free market. The major shelters from this necessity are: (1) the welfare state, which substantially obviates the need for immigrants to compete, and (2) the status of “illegal alien,” which gives rise to black markets in which English is unnecessary. Americans concerned about immigrants learning English should oppose welfare programs and advocate a policy of open immigration, under which the now thriving black markets would wither away. Finally, if by “We have a right to our culture” opponents of immigration are speaking of a right to their lifestyle preferences—their music, their cuisine, their mode of dress, and so forth—then they should be arguing not against immigration but for open immigration: The right to one’s lifestyle preferences means the right to one’s pursuit of happiness (i.e., the right to seek the values of one’s choice), which one exercises by acting on one’s own judgment while respecting the right of others—including immigrants—to do the same. The “We have a right to our culture” argument against immigration is at worst unspeakably evil and at best an argument for open immigration. As mentioned earlier, there is no such thing as a right to a job; such a “right” on the part of one person would necessitate the use of force against others. Nor, for the same reason, is there any such thing as a “right” to a wage rate, which would violate the rights of employers and employees to set mutually beneficial terms of doing business with each other. If a man is fired from a job—or if his wages are reduced—because a willing immigrant is able to do the job better or cheaper, no force has thereby been used against the fired man; he remains free to act on his own judgment. He can and should either improve his skills or offer his services for less or seek another job or start his own business or think of something better to do. But he has no right to have the government prevent the employer and the immigrant from doing business with each other. 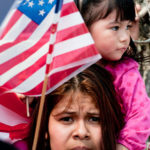 The desire of certain U.S. workers and labor-union members for the government to grant them an entitlement to a job created by someone else—or to a wage paid by someone else—is not an argument against immigration, but a consequence of a false and grossly un-American premise: the notion that “might makes right.” In reality, and in accordance with the basic principle of America, whether a person is best qualified for a given job is determined not by a gun but by the free market. No one, and no group, has a right to forcibly exclude from the marketplace those with whom he or they cannot compete—and no true American would claim such a right or advocate such force. The “We Americans have a right to our jobs and wage rates” argument against immigration is invalid and un-American. Most immigrants do not come to America to live on the public dole; most come to enjoy America’s (relative) freedom, to work hard, and to be self-sufficient. The fact that some immigrants come to America to leech off our welfare state is an argument not against immigration but against the welfare state—which, by coercively redistributing the wealth of productive Americans, attracts foreign parasites (and encourages domestic ones). Punishing an individual for someone else’s wrongdoing is patently immoral—and the wrongdoing here is not just that of the relatively few immigrants who seek welfare handouts. The greater wrongdoing is that of the American intellectuals, citizens, and politicians who established and who maintain the welfare state. For America to bar would-be immigrants from entry to America because of immoral “welfare” policies instituted by Americans is the height of injustice. 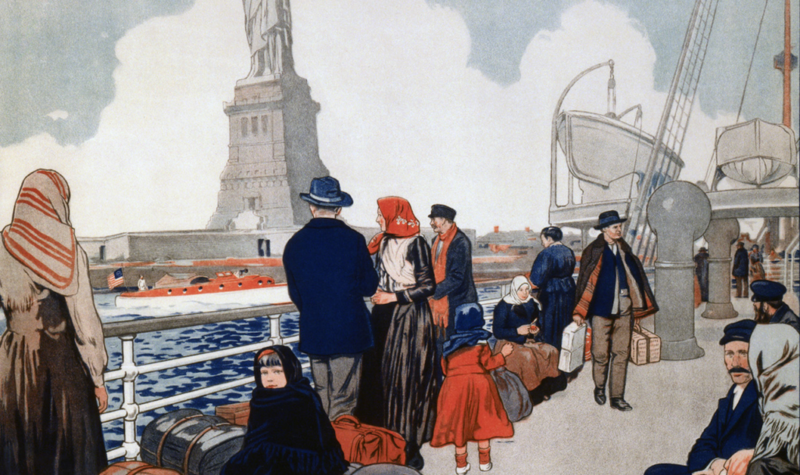 What should we do about the problem of welfare with regard to immigrants? We should mercifully bar immigrants from any involvement in this legalized violation of rights. This would be good both for immigrants and for Americans. In order to live the good life, immigrants, like all human beings, need to develop and maintain the virtue of independence; they need to face the demands of reality and live by their own thought and effort. 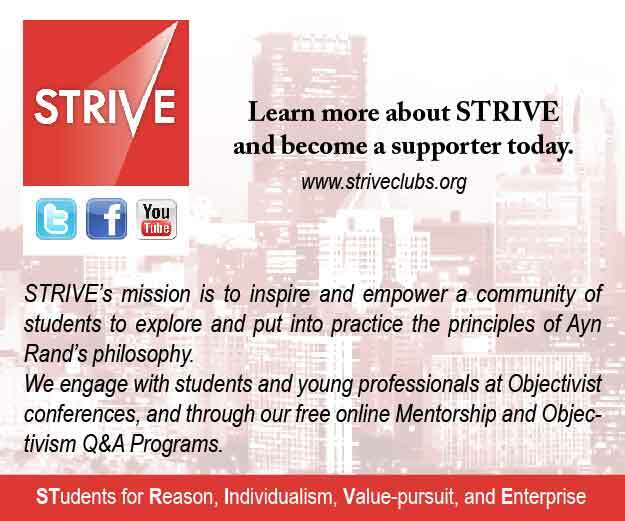 Precluding them from receiving the so-called “benefits” of welfare will help them to develop or maintain that virtue. By not receiving stolen goods, immigrants would retain the natural incentive to earn their success by working. And by not using government schools, immigrants would have the opportunity to provide their children with quality education—whether by sending them to private school or by homeschooling them. (There are many immigrants here in southern California who already do one or the other.) Of course, insofar as immigrants are excluded from receiving welfare and using government schools, they should also be exempted from paying taxes toward these illegitimate programs. The “Immigrants seek welfare, so we can’t afford them” argument against immigration is not an argument against immigration; it is an argument against the welfare state and all its life-thwarting manifestations. Punishing would-be immigrants for the moral failings of a few immigrants—and for the moral failings of Americans and their intellectual and political leaders—is immoral. Yes, there are statistics showing that some immigrants commit crime. There are also statistics showing that some native-born Americans commit crime. Statistics showing that some people commit crime, however, say nothing about what any particular person will do; and group statistics as such are wholly irrelevant to the question of whether an individual should be free to act on his judgment. If an immigrant chooses to be irrational and commits a crime, then, like anyone who commits a crime, he should suffer the consequences of his wrongdoing. But the presumption of innocence reigns here: An individual is logically and morally to be presumed innocent until proven guilty. 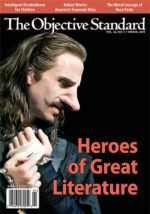 Individuals who leave socialist, communist, or theocratic hellholes to seek a better life in America are not criminals to be punished but heroes to be admired (would that more Americans were so inspiring). To arbitrarily judge them as corrupt or to condemn them to the third-world hell into which they were accidentally born on the “grounds” that some immigrants commit crime is logically absurd and morally obscene. The “Statistics show that immigrants commit a lot of crime” argument is an evasion of the self-evident fact of free will, and it betrays a thoroughly collectivist mentality on the part of those who advance it. This claim—which amounts to: “We can’t begin implementing the principles of laissez-faire capitalism until we live under laissez-faire capitalism” or “We can’t begin upholding the principle of individual rights until the principle of individual rights is fully upheld”—reverses cause and effect. The only way to achieve a fully rights-respecting society is to begin moving incrementally in that direction, by consistently taking action in every area in which such progress is possible. We must make a concerted effort toward (among other things) eradicating so-called entitlement programs, liquidating government schools (i.e., establishing a free market in education), repealing antitrust laws, eliminating eminent domain, implementing a self-interested foreign policy, and establishing a policy of open immigration. None of these aspects of a free society can ever be fully accomplished apart from a principled effort to accomplish the whole, but each and every one of them can be accomplished step-by-step over time—if we grasp and appeal to the principle by reference to which each is a morally necessary measure: the principle of individual rights. The “We must wait for laissez-faire” argument against open immigration is invalid and betrays a fundamental misunderstanding of the nature of positive political change. What makes it easy for terrorists to enter America is (a) the 12,000-mile perimeter of the contiguous forty-eight states (not to mention Alaska and Hawaii) combined with (b) the fact that the U.S. government has not eliminated the states that sponsor terrorism. The solution to the problem of terrorists harming or threatening Americans is not to violate the rights of would-be immigrants, but to annihilate the states that sponsor terrorism. Islamic terrorism against the “Great Satan” is not a lone-wolf activity; it is fueled and made possible by the material and spiritual support of Islamist regimes—regimes such as those in Iran and Saudi Arabia. To end terrorism against America, we must end such regimes. Banning Mexicans, Canadians, Indians, and Sudanese from seeking the American dream has exactly nothing to do with ending terrorism or protecting America. Neither closed borders nor limits on immigration can stop terrorists from entering this country. All that is accomplished by banning or limiting immigration is the violation of individual rights. Those concerned about terrorists harming Americans should advocate (a) the summary elimination of all regimes that have financed or called for or otherwise incited harm to Americans, and (b) a policy of open immigration to the “Great Satan.” With the state sponsors of terrorism destroyed, and with an American policy of open immigration in place, anyone attempting to enter the U.S. at a non-designated location could legitimately be considered a threat to the rights of Americans and dealt with accordingly. The “American security requires immigration restrictions” argument against open immigration is invalid and suicidal. To violate the rights of would-be immigrants while ignoring the wrongs of American-murdering regimes is unjust and insane. The foregoing examples demonstrate that one cannot argue from a rights-respecting, American perspective against a policy of open immigration—because the basic principle of America, the principle of individual rights, mandates open immigration. Bearing that in mind, what should we do about the estimated 12 million “illegal” immigrants currently residing in the U.S.? Some argue that granting amnesty to “illegal” immigrants would make a mockery of the rule of law and that “illegals” broke our laws and should be held accountable for having done so. On the contrary, what mocks the rule of law is the existence and attempted enforcement of anti-immigration laws. Upholding the rule of law does not mean upholding whatever laws happen to be on the books. Should the citizens of Nazi Germany have turned Jews over to the Gestapo? Nazi law dictated that they must. Would the refusal to obey that law have been a mockery of the rule of law? 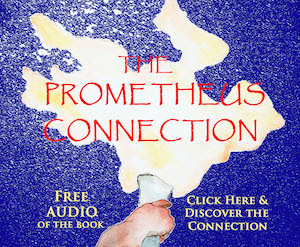 Should the citizens of theocratic Iran behead apostates? That is what Shariah law calls for. Would refusal to do so mock the rule of law? Should Americans living in the North in the 1850s have returned runaway slaves to their Southern “owners” in compliance with the Fugitive Slave Act? Did violators of this act mock the rule of law? Upholding the rule of law does not mean enforcing illegitimate laws; it means establishing and maintaining a government and legal system based on the objective social requirements of human life—namely: the recognition and protection of individual rights. Laws that violate individual rights are illegitimate laws, and such laws morally must be repealed. Consciously “violating” such laws in order to sustain and further one’s life (or the lives of others) is not a violation of the rule of law; it is a recognition of the fact that valid moral principles trump invalid political policies. Although the political status of 12 million immigrants now residing in America is “illegal,” the moral status of most of them is: American. They risked life and limb to get here; they do everything they can to stay here; and they endure all the trouble that comes with being labeled “illegal”—all in pursuit of a better life for themselves and their families in the freest country on earth. What could be more American than that? As to the specific steps required to achieve a rights-respecting and thus moral immigration policy for the U.S., here is a broad five-point plan, all aspects of which should be advocated simultaneously and by reference to the moral principle that mandates them: the principle of individual rights. Repeal all laws restricting immigration; do away with all quotas, visas, green-cards, and the like; make open immigration the law of the land. Grant unconditional amnesty to all so-called “illegal” immigrants, and apologize to them for the trouble our immoral laws have caused them. Exclude immigrants from receiving welfare and from using government schools—and exempt them from paying taxes toward these immoral programs. Declare war on Iran; eliminate its current regime; and announce to the world that, from now on, this is how America will deal with regimes that threaten our citizens, our immigrants, or our allies. Turn next to the Saudi regime. Repeat as necessary. Accomplishing these measures will require substantial time, effort, and intellectual activism, but there is no shortcut; these are the actions necessary to solve the misnamed “immigration problem,” which is, in fact, a problem of too few Americans recognizing, embracing, and upholding the basic principle on which America was founded. Those who argue that the “immigration problem” is too “pressing” and requires more “expedient” measures—or too “complex” and requires measures more “agreeable” to opponents of individual rights—either misunderstand the nature of the problem or choose to evade it. The problem, however, is what it is, and if Americans want to solve it, we must recognize its actual nature and proceed accordingly. Help defend the rights of foreigners to immigrate to America and the rights of Americans to associate with them. Fight this battle by understanding and appealing to the principle of individual rights. It is the proper governing principle in politics, and it mandates open immigration. Acknowledgments: I wish to thank Alan Germani for editing this article, and Joe Kroeger and John David Lewis for their helpful comments on the manuscript. —C. B. 1 The Writings of George Washington (Washington D.C.: United States Government Printing Office, 1938), ed. John C. Fitzpatrick, vol. 27, p. 254 (capitalization and spelling in the original). 2 Carriers of deadly contagious diseases such as cholera, diphtheria, infectious tuberculosis, smallpox, yellow fever, and severe acute respiratory syndrome (SARS)—who would thus pose an objective threat to the lives and health of Americans—are legitimately forbidden entry to America (unless they are being safely transported to a private facility for medical treatment). Exactly where the line should be drawn regarding the immigration of people carrying less-dangerous contagious diseases is a technical matter to be determined by medical and legal experts. 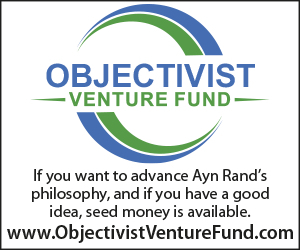 3 Regarding the principle that reason is man’s basic means of survival, see Ayn Rand, “The Objectivist Ethics,” in The Virtue of Selfishness (New York: Signet, 1964), esp. pp. 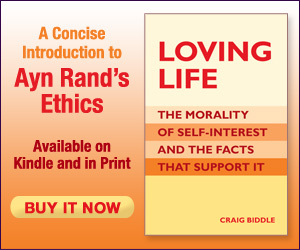 22–29; and Craig Biddle, Loving Life: The Morality of Self-Interest and the Facts that Support It (Richmond: Glen Allen Press, 2002), esp. pp. 53–62. 4 Regarding the evil of initiatory force and the principle that rights can be violated only by means of force, see Rand, “Man’s Rights” and “The Nature of Government” in The Virtue of Selfishness, pp. 108–117 and 125–134 respectively; and Biddle, Loving Life, pp. 103–128. 5 The rights of children are more complex than those of adults, and there are situations in which it is morally appropriate for an adult to use force to stop a child from acting on his judgment. 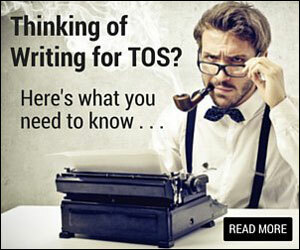 An article on this subject is in the works for a future issue of TOS. 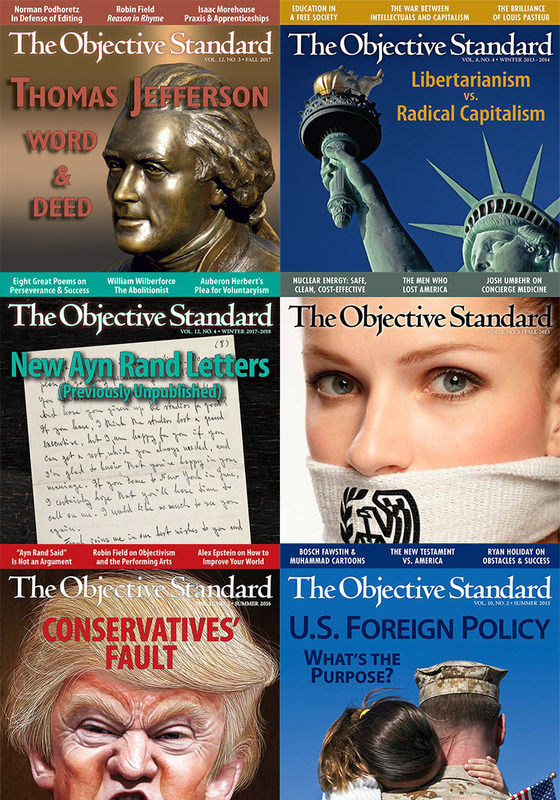 6 For more on the proper purpose of government, see Rand, “The Nature of Government,” in The Virtue of Selfishness, pp. 125–134; and Biddle, Loving Life, pp. 117–128. 7 For more on the problem with “public” property and the propriety of exclusively private property, see Biddle, Loving Life, pp. 119–23. 8 Regarding the nature of free will and the choice to think as the primary choice, see Rand, “The Objectivist Ethics,” in The Virtue of Selfishness, pp. 22–25.